Hump Day already! Halfway through this shortened work week for those of you who had off from work and/or school. 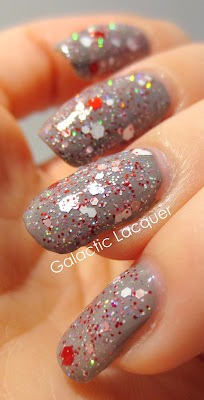 I have another wonderful polish to share this Wednesday from Different Dimension's Santa Baby collection. Like some of the sassy lines from the song, I think this polish is pretty sassy for the holiday season. It isn't the typical red and green of the season, but instead it is red, white, and pink. The pink is just perfect with the red and white though, and it almost reminds me of a smashed candy cane or peppermint candy! I wanted to put it over a color where you could see both the white and red pieces well. I applied one coat of Santa Baby over Essie's Chinchilly, which is a warm gray. 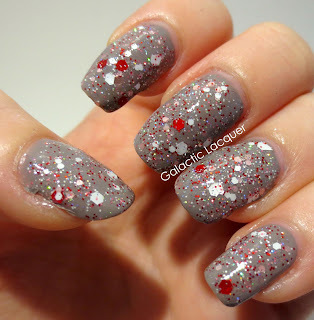 This polish is so packed with glitter, that one coat is all it took! I considered two, but one looked fine. It has lots of little white, pink, and red micro glitter, along with lots of tiny holographic bits to really make it shine. Like all of Different Dimension's polishes, I absolutely love this one! It covers well, it's unique, and it has the perfect balance of different sized glitter. You can purchase Santa Baby from Different Dimenion's Etsy shop. 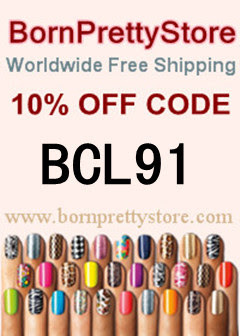 Santa Baby is $8.50 for a full size bottle, or you can buy the entire Santa Baby collection together for $60 (8 polishes). This polish was provided for review by Different Dimension. As always, I only offer my honest opinion. So pretty! I think that one would also be really cute over baby pink on Valentine's Day!